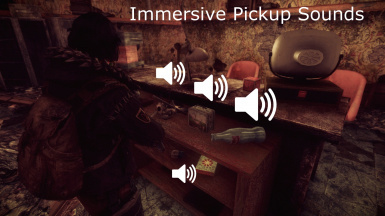 Load this mod above FWE, open FO3Edit and carry over the sound edit to the last mod in your load order. Takes ten mins to patch this mod and any mod that puts another layer of sound diversity into the game is worth the work. Endorsed. can you give us more details ? This mod undoes the unofficial item fixes (food items are Big Guns again instead of food, etc). Excuse me, where is the FWE patch? I can't find any of those. does anyone have a working patch that makes this mod compatible with FWE? What mods did you use in that video? it looks amazing! I've been successfully using this with a non FWE load order. I found that I only needed to delete a couple of sound pick ups for EVE grenade entries. That and add a few stats from other mods to this one. Works great !! If you ever update this... you're missing the beer bottle sound pick up. Noticeable too, as there are a lot of beer bottles in the game. I try to keep a 12 pack in my fridge at all times.You could just apply the same sound used for nuka cola. Works for me anyway. Also, it looks like you're using your mod with FWE, if I'm viewing the video correctly. I'm seeing gunpowder and asprin in the video, so why didn't you address the primary needs issues yourself? Just sayin. Anyway, that Magician13 guy, or whatever has removed all of his mods from the Nexus, so his patch is no longer available. If you run a conflict report with FO3Edit, you will see why this mod wrecks other mods. When it introduces the sounds... it eliminates any other mod settings, by not carrying their stats over. It basically erases them. Making edits and moving your load around is the only way to fix it. I personally find it more trouble than it's worth. It's really not the authors fault either. Just the way mods work together. I'm guessing that's why nobody ever did this before. Great sound mod though, if you can get it to play nice. Edit: I would pretty much forget about using this mod if you're using any major mods. I just did a conflict report and found it negates EVE setting effects for more than a few grenades. No getting around it either, unless you want to make patches all day long. No thanks. This is so good I am willing to live with the FWE conflicts, but I hope you are working on an update. Thanks! There is a FWE update, check the comments below. Though it seem that the update is no longer available, so may have to contact the user. Wow. This really improves looting and scavenging. Great mod. High quality sounds. Kudos and thanks.